Are you looking for an AR111 12W? 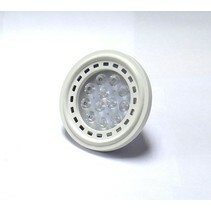 This AR111 LED dimmable 12W 12V G53 is a gain for every interior and can be ordered in grey at My Planet LED. We are one of the biggest online LED light shops and we deliver your order as well nationally as internationally. Our customers say we provide an excellent personalized service! This AR111 LED dimmable 12W 12V G53 is dimmable and has a wattage of 12W. The light colour temperature is nice warm white (2700 Kelvin). It's available with a G53 fitting and in 12V. The available beam is 24°. The light intensity is 600 lumen and with this, it's the equivalent of a halogen lamp of 50W. The colour is nice grey. In addition, the colour rendering index is more than 80 Ra, which means that the authenticity of the light colour is good. Besides the fact that this AR111 LED dimmable 12W 12V G53 is very nice, there are more reasons to buy it at My Planet LED. You can order easyly and quickly with us. Do you hesitate about it? No problem! You can use our 14 days return policy. This allows you to see if it fits with your fixture. And of course, My Planet LED has an excellent service. Do you have more questions? Contact us via phone (+32) 57 466 866 or by mail (info@myplanetled.com) in order to obtain more information about this AR111 LED dimmable 12W 12V G53.